I hope you guys love Mexican spices as much as I do. Considering how often I use them in my recipes, I’m going to assume you must since you are back for more. I seriously can not get enough of these messy sammys! I’ve been eating them 3 at a time. 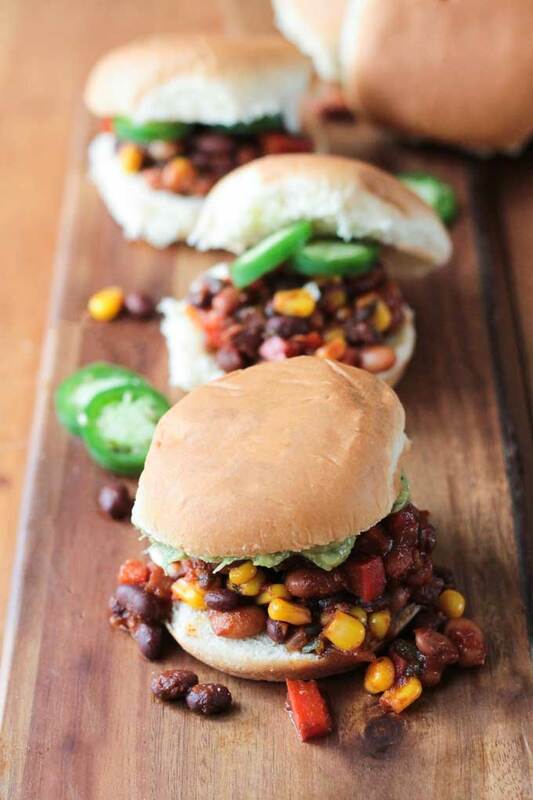 How about a large pitcher of margaritas alongside a tray full of these little slider sized Mexican Sloppy Joes? Who’s with me? Let’s get our fiesta on! 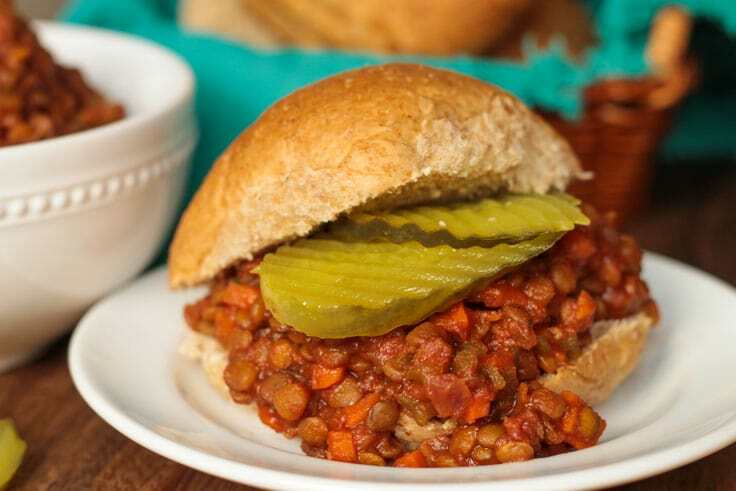 Most sloppy joe recipes are made with a base of tomato sauce, like my Sloppy Lentil Sandwiches which everyone loves, and I did consider that for a brief moment. As luck would have it though, I didn’t even have any tomato sauce in my pantry the day I set out to make these. But, you know what I did have? Salsa! You guys know about my salsa addiction, right? I had several different kinds, but I opted for my fave Salsa Autentica from Trader Joe’s. (<- affiliate link – and way more expensive on Amazon than at TJ’s…so just go there and get it!). Your favorite salsa will work too, so just choose one you love. After you add your spices to the sauce, load it up with the beans and veggies. I used a mix of pinto beans and black beans and then added corn, red bell peppers and jalapeño. Such an amazing combo – trust me! And if that’s not enough, I slathered the buns with the BEST Guacamole and added even more jalapeño slices on top. I left these extra jalapeños off the ones I served the kids. Speaking of the kids, all three gave these Meatless Mexican Sloppy Joes two thumbs up! It didn’t hurt that I served them with a side of tortilla chips and salsa (duh!). I can’t wait for you guys to try these! If you make them, snap a pic and tag me on Twitter or Instagram. Be sure to leave me your feedback here on this post too. They are quickly becoming a family favorite around here and I hope they do at your house too! Mexican Sloppy Joes - this classic messy sandwich gets a meatless makeover and a lot more spice. Serve 'em up with tortilla chips and salsa on the side and wash 'em down with a pitcher of margaritas. It's fiesta time! Whisk all the ingredients for the Mexican BBQ Sauce in a medium bowl until well combined. Set aside. In a large skillet over medium-high heat, sauté the red onion for 3-4 min until softened. Add the garlic and sauté another minute. Add the red bell pepper and jalapeño and sauté 3-4 minutes, adding the additional 2 tbsp of water if necessary so the veggies don't stick to the pan. Pour the Mexican BBQ Sauce into the pan and simmer for about 10 minutes. Add the pinto beans, black beans, and corn and stir to combine. Simmer another 5 minutes to heat through. Taste and adjust seasonings as necessary or add salt/pepper to your liking. Add the chopped cilantro and stir. Serve hot on slider buns with guacamole and extra jalapeño slices. ~Leave the ribs and seeds of your jalapeño in if you like the heat! ~Nutrition facts calculated without buns or toppings. Wow, Mary, you are fast! I love it!! So glad you loved them and how lucky your coworkers are!! Love the idea of turning it into a taco salad too! Thanks so much for your feedback! Love this recipe, it’s been too long since I have had a good sloppy joe! 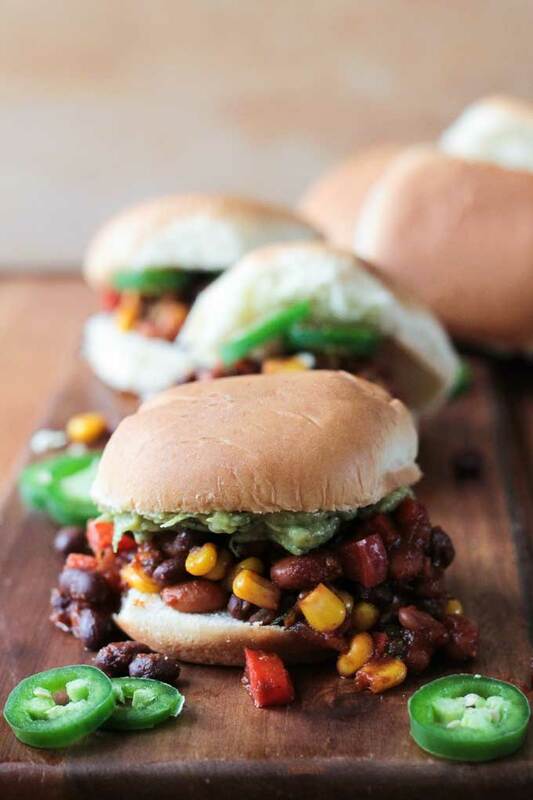 Sloppy Joes aren’t really a ‘thing’ in the UK but I would love these – I love the Mexican twist! I love Mexican food and look at all those jalapenos, yum! Spice is nice! At least in this house. 🙂 Thanks, Cathy! It’s definitely time to give it a try, Mel! I’d love to know what you think! 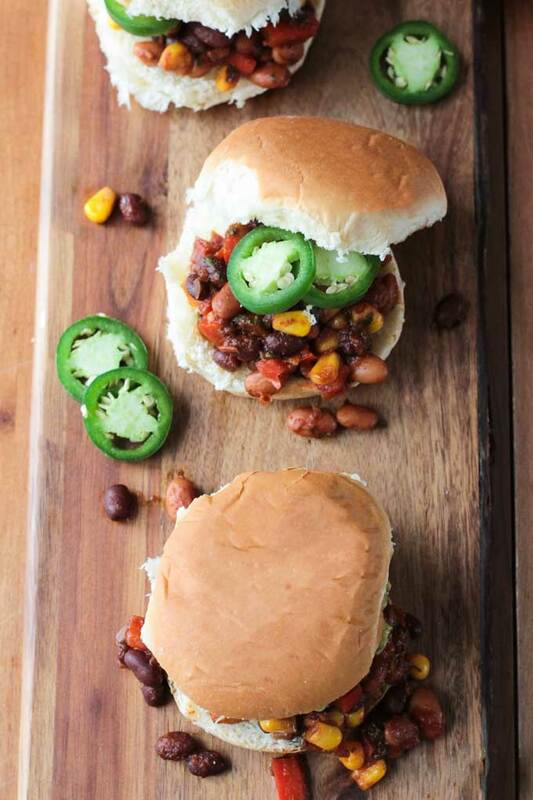 I love sloppy Joes and can’t wait to try your Mexican version! Thanks, Kathy! I hope you love them!! This sounds so yummy Jenn! 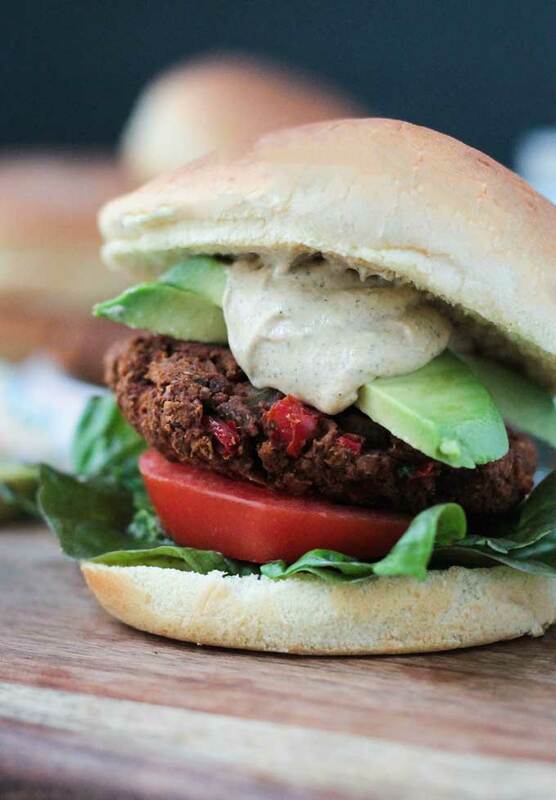 I love burgers like these and love all the ingredients you’ve used! Definitely trying this sometime. Thanks, Anjali! I hope you get a chance to try it! This will be perfect after a big game day! Love it Jen! Mexican all day every day! These are calling my name. I hear it too! You better go make some. 🙂 Thanks, Linda! Somebody hand me a napkin! These look like the perfect fill-you-up and get-a-little-messy dish! Perfect for this weekend! Yum! I totally agree! Thanks, Patricia! im loving the idea of Mexican BBQ sauce with this! Thank you, Dixya! It turned out better than I was expecting. Can’t. Stop. Eating. Them! Jenn–these are awesome!! I would take these hands down over a regular sloppy joe! Thank you so much, Kristen! They are definitely not lacking in flavor! Oh my gosh I have the same Mexican food and salsa addiction! I could put salsa on pretty much everything! These look sooo good and a great twist on the typical sloppy joes! Thank you, Brandi! I imagine you can get some pretty darn good salsa down there in TX! It’s just so good! I make my Lentil Sloppy Sandwiches all the time because we love them so much, but these Mexican ones just took over as the #1 favorite! Yay!! I love to hear that! You will love them! I can’t wait to hear what you think! Thanks, Becky! I love the combination of beans! This looks and sounds amazing and so easy to whip up! Yes, super easy! Thanks, Casey. I hope you love it! Oh yummy, you make such feel good food – I feel good just looking at it. HaHa, thanks, Trinity! I grew up on the comfort food of the midwest, so it still creeps into my healthier cooking too! I grew up with them too, but it was the sauce from the can (you know the one!). Homemade is so much better. You should totally create a soft gluten free potato bun!! I agree, soft pillowy buns are the best for sloppy joes, but this bean mixture is so good, you could just eat it with a spoon!! Thanks, Vivian! I hope you enjoy them. Please let me know how they turn out if you try them.